In 1976, the movie Network shocked audiences with its dark and cynical message about corporations using the mass media to sway and influence the mass population. Critics praised it for being a prophetic statement of the times that we were living in. Forgotten through all this hype, was that a film which had been released almost twenty years earlier, had basically told the same story. 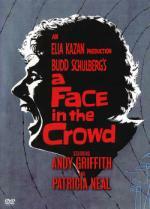 A Face in the Crowd exposed the power which one individual could obtain through the use of mass appeal and marketing through television. Based loosely on the life of Arthur Godfrey in the early fifties, the film explores the rise and fall of Lonesome Rhodes, a vagrant with a homespun philosophy that quickly takes hold of the American public through radio and television. Intoxicated with his new found power to sway the public at will Rhodes quickly becomes a demagogue, which if left unchecked could rise to a Hitlerian level. Director Elia Kazan and writer Budd Schulberg had experienced first hand how powerful television could be when they were both brought before the House Un-American Activities Committee in the early part of the decade. They had witnessed, just as the whole country had witnessed the rise of a junior senator from Wisconsin, Joseph McCarthy. McCarthy had used the televised hearings to gain power in Washington, and had ruined many lives in his ascent to the top. These hearings had left a considerable mark on Kazan’s career; he had testified before the committee and had divulged names of many of his peers in Hollywood. In 1954, he used his film On the Waterfront to justify his position before the committee; now in 1957 he took aim at the apparatus, which had stoked the fires of paranoia and fear across the country. To make the story more believable, he decided to use a newcomer to movies to play his main character. Andy Griffith had been playing on Broadway in the comedy No Time for Sergeants and was known only to a small minority who had heard his comedy record. Lonesome Rhodes would be the character that would prove that Griffith was no country bumpkin, but a talented dramatic actor. Three years later he would shoot to fame and find immortality on TV as Sheriff Andy Taylor from the pastoral hometown of Mayberry. If you only know Andy Griffith from this role or from his stint as Ben Matlock, then you need to check out his first foray in the film world. His performance will shock and delight you and hopefully get you to appreciate the underused talent that could have propelled him to fame as a versatile dramatic actor. I've always loved On The Waterfront and appreciated Kazan's position in making it. Never seen this, so I must look it up. If you like On the Waterfront, then it's a definite must see.